EFA Grantee Ruth Pastine's group exhibition, "L.A. Today" features paintings and sculptures across generations of Los Angeles artists on view at Royale Projects: Contemporary Art, curated by Carl Schlosberg. Open House: May 22nd 12-5P.M., 432 South Alameda Street, Los Angeles CA. EFA Grantee Ruth Pastine's solo exhibition "The Inevitability of Truth" features a series of paintings on view at Edward Cella Gallery through Oct 17, 2015. The show was also featured as 'Editor's Pick' in Introspective Magazine, Sept 21, 2015. Greg Flood of SF Contemporary Art Examiner reviews EFA Grantee Ruth Pastine's solo exhibition "MIND'S EYE: Sense Certainty Series" at Brian Gross Fine Art. David M. Roth of SquareCyclinder.com reviews EFA Grantee Ruth Pastine's solo exhibition Mind’s Eye/Sense Certainty Series" on view at Brian Gross Fine Art through October 25, 2014. Amy Galpin of Art Ltd magazine reviews EFA Grantee artist Ruth Pastine's new exhibition, 'INTERPLAY' at Scott White Contemporary Art on view from September 14 2013 to January 4, 2014. EFA Grantee Ruth Pastine's upcoming exhibition "Attraction" features a museum survey show 1993-2013 at MOAH- Lancaster Museum of Art & History, opening reception is onJanuary 18, 2014. EFA Grantee Ruth Pastine's new solo exhibition at Scott White Contemporary Art features Pastine's "Interplay Series," on view from September 14 2013 to January 4, 2014. EFA Grantee Ruth Pastine's two person show "R. Nelson Parrish & Ruth Pastine" features Pastine's pastel series 'Counterpoint' and Parrish's bio resin wall sculptures on view at Cabana Home, November 26, 2012 to January 17, 2013. EFA Grantee Ruth Pastine's exhibition of her new series of pastels on paper titled Counterpoint opens at Edward Cella Art + Architecture in Los Angeles this Saturday, September 8. 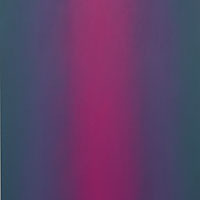 The Achenbach Foundation for Graphic Arts, Fine Arts Museums of San Francisco, has acquired Ruth Pastine's pastel on paper works Gray Blue, Double Primary Red Blue Series, 2011 and Pink (Red Light), Double Primary Red Blue Series, 2011. Former Grantee Ruth Pastine recently installed her permenant installation "Limitless" at Ernst & Young Plaza in downtown Los Angeles, CA.